The Swordfish 800XXC Micro-Cut Shredder is a highly rated machine in the Swordfish shredder range and is suitable for either home or small office use. 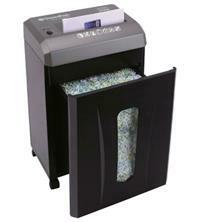 It’s ‘whisper quiet’ at only 55 dB and can shred up to 8 sheets of 80gsm paper at a time. It also offers a very high level of security, with a P-5 DIN rating and a shredded particle size of just 2 x 12mm. This means it’s suitable for highly confidential and secret shredding. The shredder will shred an A4 sheet into approximately 3,120 pieces and you can shred around 580 sheets an hour. Bin size is 17 litres and this will hold up to 280 shredded sheets. The waste bin is slide out, so is easy to empty, and in addition to paper you can also shred paper clips, small staples and credit cards. Additional features include castors for easily mobility in the home or office and a reverse option to help clear any possible paper jams. For your peace of mind, the Swordfish 800XXC Micro-Cut Shredder comes with a 2 year product warranty and 2 years warranty on the cutters too.